Do you know your warning lights? Dash warning lights, do you know what they mean? 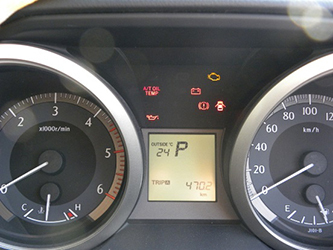 Above is a photo of an instrument panel on a Toyota Prado with the ignition on and the engine not started. Some of these lights are for driver awareness however they have no influence on the vehicle performance (door ajar) for example. Other lights shown above are critical information that as the driver you need to act on immediately. All too often vehicles are towed into our workshop having suffered major engine damage just because the driver of the vehicle did not understand the importance of what some of these lights mean. So take the time to read on, one day this knowledge may save you a lot of money. In my opinion the most important light we see above is the oil can (the one with the drip off the spout) this is known as the oil pressure warning light. It’s function is to monitor the oil pressure within the engine, if the oil pressure drops too low the light will come on. When the engine is running oil is circulated through the engine under pressure so it reaches all the moving parts inside the engine. It is on at the moment in this photo because the ignition is on but the engine is not running. It should be the same in your vehicle, when you turn on the ignition you should see this light, when you start you engine this light should go out within two or three seconds. If you are driving along and you notice this oil pressure light flickering or it turns on and stays on, something is wrong. It may be an electrical issue and there is nothing actually wrong with the oil pressure in which case you could keep driving. Or it may have lost oil pressure because there is not enough oil in the engine, or there is a blockage in the oil system, or there is a mechanical failure in the engine. If it were any of the fore mentioned you need to pull over and shut the engine down immediately, do not just pull over to the side of the road and let the engine idle. If you ignore the warning light and continue to drive and the engine has lost oil pressure you will sieze and destroy the engine within a very short time. So how can you tell why the light has come on when you are driving? Well the answer is you can’t, you are best to pull off the road safely, let the engine cool down and if you know what you are doing check the engine oil level. If you are not confident to do that, or the engine oil level is fine call our office for some advice on what to do next. Or if you are an RACQ member give them a call to have roadside assistance come to your vehicle and check it over. The last thing you want is to find out you need a replacement engine, a repair that can cost several thousand dollars, all because you ignored a little red light. This is the red light that looks like a little car battery. It is an indicator of the vehicle charging system and this light will come on if the alternator stops recharging the battery. If you were driving and this light came on the dash more than likely the vehicle would not feel different in the way it drives. In some cases though the alternator drive belt (sometimes called fan belt) may have broken and this will bring the light on. The car may still feel normal to drive but if the water pump is driven by that same drive belt the engine will start overheating. If you are driving and the battery light comes on keep an eye on the temperature guage, if the engine is overheating you will see the needle moving rapidly up the guage to hot, you will need to pull off the road and stop the engine. If not you will overheat and damage the engine. If the engine temperature does not rise you should be fine to keep driving, but not for too long. 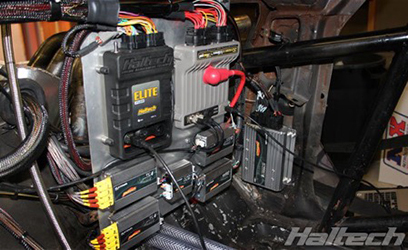 When the battery light is on, the only power supply for the vehicle is the voltage stored in the battery. Modern vehicles have a high power demand so the length of time your vehicle will keep running will depend on the size and condition of the battery, generally you only have a few hours. Once the voltage in the battery drops below a certain threshold the computer systems in your vehicle will not be able to function and the car will stop. If your battery light comes on, get it seen to as soon as possible. As the name suggests the engine temperature guage monitors engine temperature, it is good practice to get into the habit of glancing down at this guage periodically when driving. If the temperature guage rises up to hot when you are driving then you will more than likely have a mechanical issue, you need to pull off the road and get the fault inspected. NOTE- Never try to inspect the coolant level in a hot engine by opening the cooling system cap, you will risk severe burns. Where things get tricky and where a lot of drivers get caught out is that the temperature guage will only operate if the sensor unit in the engine has direct contact with the engine coolant. If for example a radiator hose blows (not uncommon) the coolant escapes rapidly from the engine, yet the temperature guage will not register that the engine is now overheating. At highway speeds serious engine damage is only moments away. If you are driving and here an abnormal bang from around the engine and in particular if accompanied by a cloud of smoke or steam, don’t rely on your gauges, pull over, carefully lift the bonnet and check it out. 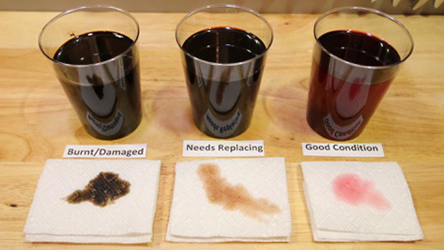 If there is coolant evident on or around the engine don’t drive and call for assistance. If you would like further advice on warning lights or clarification on any of the information above, please feel free to give our friendly staff a call, they will be more than happy to answer you questions.